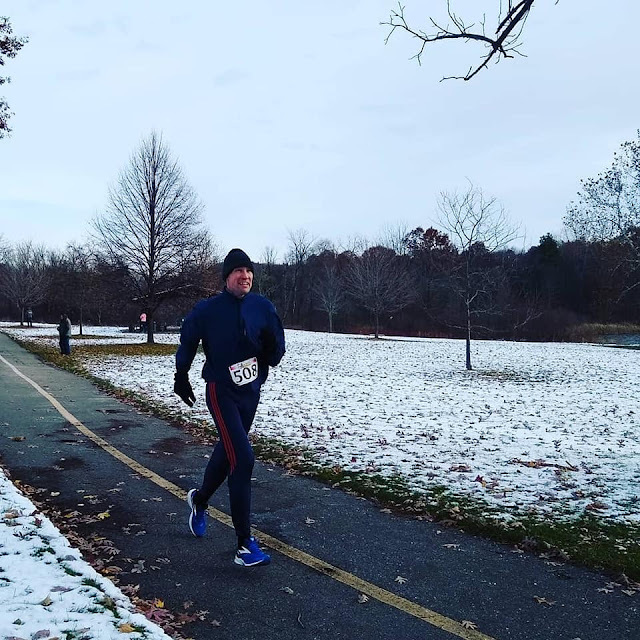 After qualifying for the Boston Marathon in May, I wanted to race some shorter distances this fall to take a break from the marathon distance. I ran a 10K last month, but my main goal for the fall was running a fast half marathon at the Stony Creek Half Marathon. Picking a race in Michigan in mid November is always a risky proposition because of our volatile fall weather. 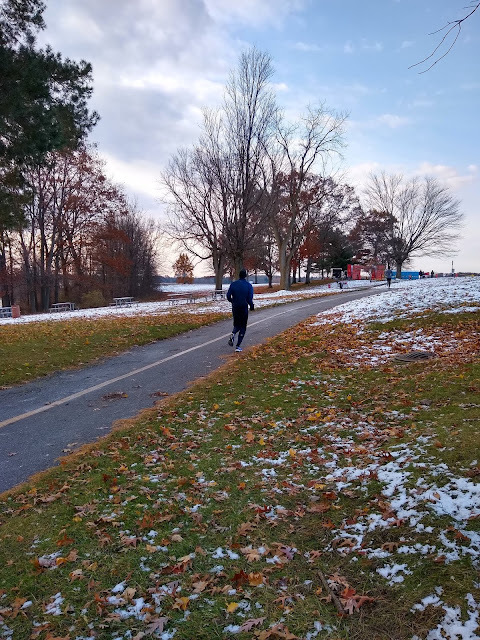 In the week leading up to the race, the forecast for Sunday's race seemed to get colder every day. When I arrived at Stony Creek Metropark for the race, it was 22 degrees with the wind chill. I picked up my race packet and went back to my car to stay warm before the start. 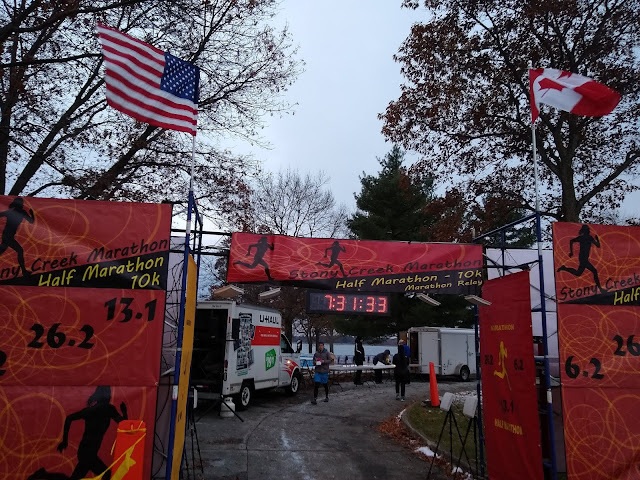 In addition to the half marathon, the race included a marathon and a 10K. All three race courses are entirely within the park's grounds. 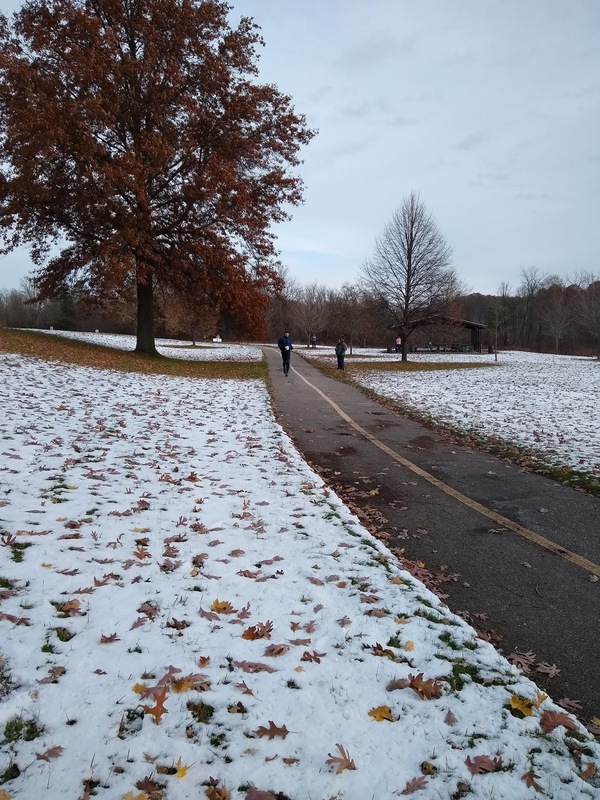 It had snowed the previous two days, but, except for one very short stretch of snow-covered grass, the entire course was on paved roads and trails that were cleared of snow. I was about halfway here and already was struggling. Other than a few rolling hills in the first few miles, the course is pretty flat. 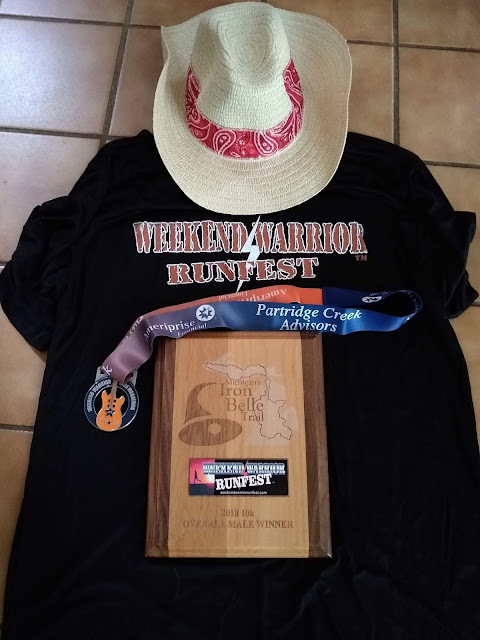 My goal was to run sub-1:30, but I knew it would be tough because I had been struggling with my training in the last few weeks before the race. I tried to stay near the lead pack, but I fell off the pace about 4 miles in. It didn't help that I lost the lead pack right as I hit a stiff, cold headwind. My splits got progressively slower after that. 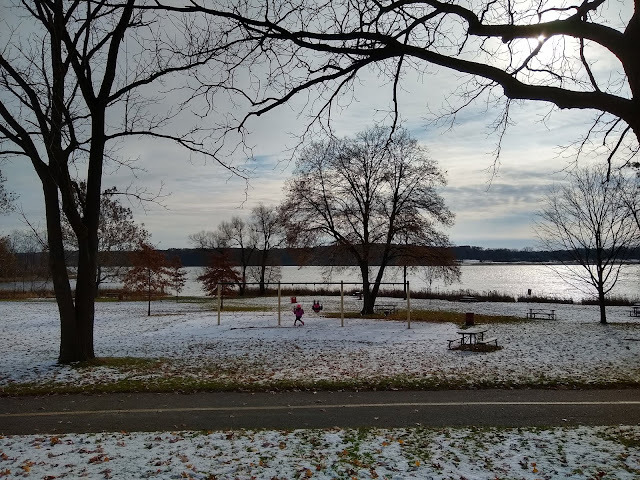 On a warmer day, I might have enjoyed the scenery more (Stony Creek is a beautiful park), but I just kept my head down and plodded forward. Even though my goal had slipped out of reach, I knew a PR was still possible, so I ignored the urge to quit and tried to maintain an even pace. 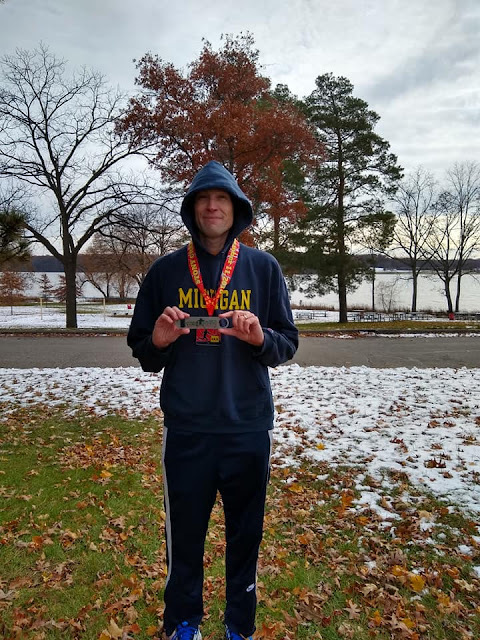 I did hold on for a PR (1:35:37.9) and finished second in my age group, but this is the first time I wasn't satisfied with a PR, mostly because I ran nearly as fast during the first half of my last marathon (1:36:50). Hey! That's me running again! Overall, the race was what I would expect from a small, local race. 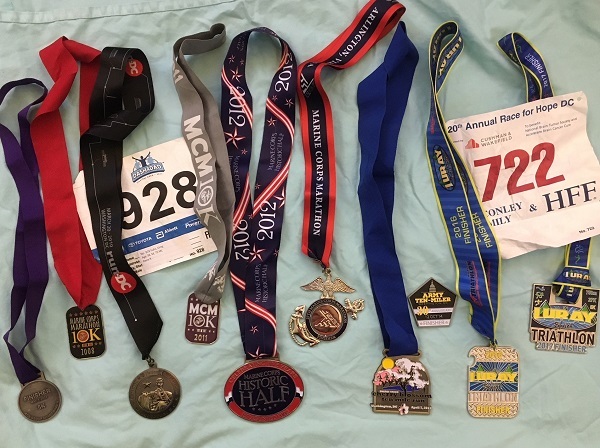 There weren't a lot of perks you'd get at a big city marathon, but the medals and shirts were nice. I also got a nice bottle opener for my age group finish. 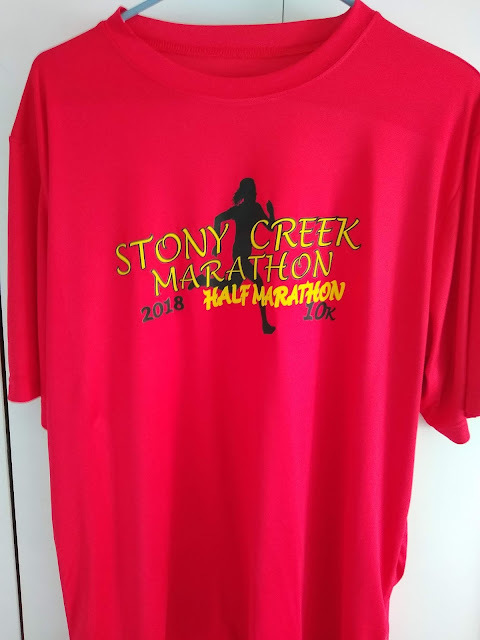 I don't normally wear the race shirt during the race, but I used this as an extra layer on race day. The volunteers were great, especially since they had to stand out in the cold weather for hours. (Thank you, volunteers!) The course could have used better markings or volunteers at a few spots to tell runners where to go. I actually took one small wrong turn, but luckily the organizers had signs up saying not to go that way. The wrong turn probably only cost me 10-20 extra feet, but it was frustrating when it happened. Despite my disappointing result, I'd consider running the half again or the 10k. Hopefully the weather is a little better for next year's runners. Disappointed with my time, but always grateful to be able to run.